Millwood Mennonite Church (Biblical Mennonite Alliance), located two miles (3 km) northeast of Gap, Lancaster County, Pennsylvania, since 1945 a member of the Lancaster Mennonite Conference, was formed in 1877 with 22 families consisting of 124 members from the Old Order Amish community in this district, under the leadership of Gideon Stoltzfus, who had been ordained a minister in 1868 by the Old Order Amish, and was ordained bishop in 1888, serving in this office until his death in 1913. The congregation met in members' homes every two weeks until 1882, when the first meetinghouse was built (frame 36 x 50 ft.), which served the congregation until 1937, when a brick structure was erected. John A. Kennel, ordained bishop in 1926, assisted by LeRoy S. Stoltzfus, ordained bishop in 1949, were serving as bishops in 1955. Ministers and deacons that have formerly served were Samuel Lantz, John M. Stoltzfus, Daniel Stoltzfus, Amos B. Stoltzfus, M. S. Stoltzfus, Frank Stoltzfus, George B. Stoltzfus, John P. Kennel, Aaron Mast, and Isaac G. Kennel. After 1929 the congregation established the following mission outposts which together with the home congregation constituted the Millwood district membership of 431 in 1954: Coatesville (1929), Parkesburg (1938), Homeville (1945), Newlinville (1949), and Kennett Square (1951). In 1954 the Millwood congregation proper had 222 members, with Reuben G. Stoltzfus as preacher in addition to the two bishops. In 1909 the Millwood congregation built a second meetinghouse, known as Maple Grove, but continued to function as one congregation. In 1945 a division occurred, the more conservative one-third minority withdrawing under Bishop John Kennel's leadership to join the Lancaster Conference (the only congregation of Amish background in the conference) and taking the Millwood meetinghouse. 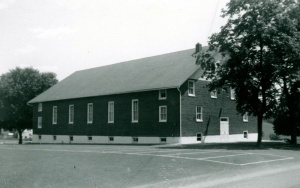 The more progressive two-thirds majority (1954 membership 458) continued the congregation's membership in the Ohio and Eastern A.M. Conference, taking Maple Grove meetinghouse. On 25 February 2012 the church joined the Biblical Mennonite Alliance. In 2015 the leading minister was Keith Beiler and the associate pastors were Elvin Ressler and Luke Sensenig. The congregational membership was 105 and the average weekly attendance was 100. Biblical Mennonite Alliance. "BMA Directory 2012." Web. 15 May 2012. http://www.biblicalmennonite.com/. Hege, Christian and Christian Neff. Mennonitisches Lexikon, 4 vols. Frankfurt & Weierhof: Hege; Karlsruhe: Schneider, 1913-1967: v. III, 138. Stoltzfus, LeRoy S. and Richard D. Thiessen. "Millwood Mennonite Church (Gap, Pennsylvania, USA)." Global Anabaptist Mennonite Encyclopedia Online. May 2012. Web. 22 Apr 2019. http://gameo.org/index.php?title=Millwood_Mennonite_Church_(Gap,_Pennsylvania,_USA)&oldid=145887. Stoltzfus, LeRoy S. and Richard D. Thiessen. (May 2012). Millwood Mennonite Church (Gap, Pennsylvania, USA). Global Anabaptist Mennonite Encyclopedia Online. Retrieved 22 April 2019, from http://gameo.org/index.php?title=Millwood_Mennonite_Church_(Gap,_Pennsylvania,_USA)&oldid=145887.